After losing 3 babies to rare birth defects at Egyptian hospitals, a Gaza mother followed doctors' advice and took her fourth to Israel. 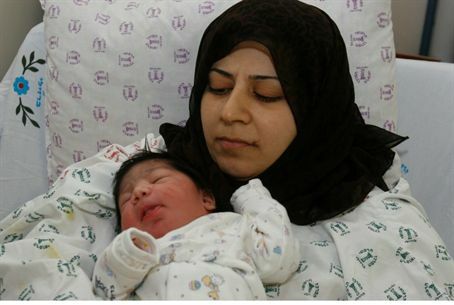 A Palestinian Authority mother from Gaza is home with a healthy baby thanks to Israeli doctors in Kfar Sava, after a complicated surgery. After losing three babies to rare birth defects at Egyptian hospitals, Jian Abu Agram, 31, was faced with a difficult decision last year after another child was born last April with the same condition. After speaking with her doctors, Agram took their advice and traveled through the Erez crossing with her infant daughter to Israel, where doctors at Meir Hospital performed intestinal surgery on the little girl. "When the doctors told me of her condition and suggested that we bring her to Israel, I didn't think for a moment of the conflict between the two peoples,” Agram told the Hebrew-language weekly local Sharon region edition of the Yediot Acharanot newspaper. The infant has since recovered from the intricate life-saving treatment that she needed, and two weeks ago returned to her home in Gaza. While Israel is engaged in life-saving efforts to help the children of Gaza, a leftist website last week accused Jerusalem of creating the latest SARS virus strain identified by the World Health Organization (WHO) in Saudi Arabia in order to attack "specific Arab communities." Israel's Health Ministry has issued an alert to all hospitals and medical personnel in response to news of the new SARS virus strain, known as a Coronavirus.